Decent quality climbing leads to a cool platform in a great location (bring your lunch and hang out). 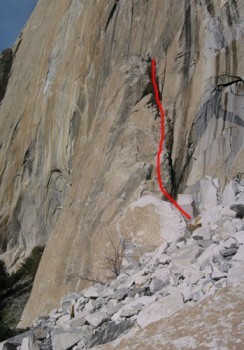 After only one pitch, you will feel like you are up on El Cap. Protection is sparse so this is only for 5.6 and better leaders. Rappel to The Bluffer with one 60m rope or bring two ropes to rappel to the ground. After a rainstorm, the route dries quickly. If sunny, this climb is too hot in the summer. Which SuperTopo guidebooks include a topo for The Footstool, Right?